After much experimentation, the Conserve team hit upon the idea of not recycling, but upcycling by washing, drying, and pressing the bags into sheets. 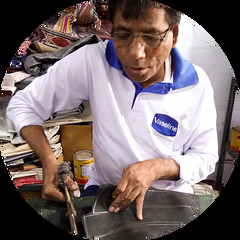 åÊHandmade Recycled Plastic (HRP) was born and designs for handbags, wallets, shoes and belts quickly came flooding in. åÊThe challenge was obvious: Use high fashion to support better lives for the poorest and a cleaner environment for all.